UNITED NATIONS, July 1 -- Halfway through a torrent of less than favorable reviews of the first half of his five year term as UN Secretary General, Ban Ki-moon and those around him have suddenly sought more and more tightly controlled press coverage. Outlandish claims of accomplishment are made, that Ban saved 500,000 people in Myanmar, that he is the second most trusted leader in the world, and number one on climate change. The strategy is viewed as risky, even by UN supporters. On June 30 a senior Security Council diplomat told Inner City Press that Ban should just "lie low" for the rest of the summer and use the time to replace some of the advisers and officials who have brought him to this point, who "don't seem to be able to tell Ban what is really going on." While the first part of this advice is not being followed, perhaps the latter will be, or some officials will simply leave for their own reasons. The current spate of reviews of Ban's performance began with a report card in The Economist, ranking Ban three out of ten for "speaking truth to power" and two out of ten for management. Inner City Press asked Ban to respond, during his last press conference. Showing rare passion, Ban lashed out at his critics, saying he needs more resources, he needs more support. What followed were even more negative reviews, in the Financial Times and Foreign Policy. Then began the publish counter offensive. 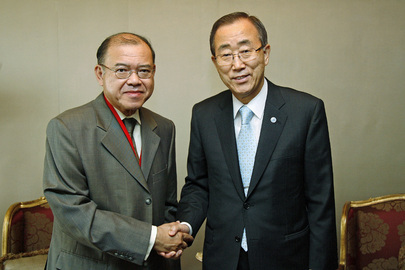 Ban appeared on the Charlie Rose television show, where he made his claim to have saved half a million Burmese. This exact phrase had earlier been deployed in interviews with publications now preparing their own Ban first half reviews. Two major newspapers are now competing on who will come out first, while a third -- a ailing West Coast daily which no longer covers Ban's UN day to day -- has been brought in on little notice with the expectation that its verdict will be more positive. In the interim, UN supporters have been countered with mostly online pro-Ban pieces. Before his current trip beginning in Japan then Myanmar, Ban did a separate sit-down with Japanese reporters. Rather than tell the whole UN press corps about the Burma trip, his Spokesperson's Office pre-selected not only the organizations which would be allowed to come, but even the particular reporters. The fear, as one of Ban's 38th floor advisers told Inner City Press, is that Burma may become "Sri Lanka Two," an embarrassment in which the re-imprisonment of Aung San Suu Kyi, like the bombardment then internment of Tamils, is legitimated by a seemingly hapless UN Secretary General. But if that is what happens, who can it be reported differently? The shifting ways Ban dealt with Kosovo -- going silent when asked about the legality from the UN perspective of recognizing the theretofore Serbian provinces' unilateral declaration of independence -- and then with Abkhazia and South Ossetia are fodder for forthcoming reviews, as is Ban's claim to have been responsible for the deployment of UN peacekeepers in Darfur. There are pieces in the works, unless destructive deadline competition curtail them, to assess and take apart even Ban's claims on climate change. Team Ban's recently reach-out to selected media is undermined, meanwhile, by anti-press initiatives by his management and Capital Master Plan officials. These were summarized in a "Dear Colleague" letter circulated to the 435 members of the House of Representatives earlier this week, the text of which is below. 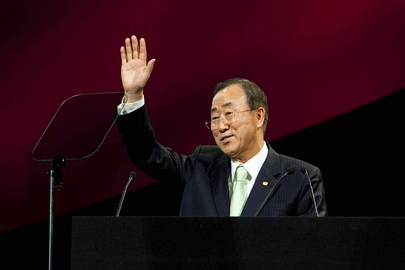 At UN, Team Ban's anti-Press strategy going goodbye? "Angered by past and continuing media reports of corruption, mismanagement and inaction at the United Nations, the UN is again seeking to cover up evidence and stifle freedom of the press. The UN's Department of Management is also reportedly pushing to obstruct press coverage, seeking to charge media outlets $23,000 to maintain office space, and to move journalists covering the UN into open, un-walled offices -- deterring whistleblowers from coming forth and preventing oversight. These UN efforts to restrict press freedom and oversight directly contravene the Universal Declaration of Human Rights, which recognized that 'Everyone has the right to freedom of opinion and expression... and to seek, receive and impart information and ideas through any media and regardless of frontiers.' Once again, the UN is actually undermining the principles on which it was founded." The May 8 meeting, involving Under Secretaries General Angela Kane (Management), Kiyo Akasaka (Public Information) and Patricia O'Brien (Legal Affairs), as well as Secretary General Ban Ki-moon's speech writer Michael Meyer and Spokesperson Michele Montas, was memorialized in a memo from Ms. Kane to Ban. Inner City Press was shown the memo, wrote and asked Ban's spokeswoman Michele Montas about it by email, along with the three USGs, none of whom has yet to explain how their participation is consistent not only with the First Amendment, which they say does not apply, but even to the cited Article 19 of the Universal Declaration of Human Rights. Ban's Spokesperson Michele Montas is widely reported to be leaving in November. His speech writer is said to still review to his previous employer, Newsweek, as "we." Angela Kane, who convened and summarized the anti-Press meeting, is said by Staff Union sources to be leaving. The UN's top lawyer is rarely if even seen in the building, having done only one press conference in all her time on the job. Ban's senior adviser Kim Won-soo has yet to do any on the record press conference, although he speaks extensively on background for the forthcoming Ban reviews. He and Ban are joined at the hip. Whether the press strategy adopted by the 38th floor is working is in serious doubt, as is whether Ban will take the symptomatic advice offered Tuesday, to in essence lay low, shake up and start over. Watch this site.